If you're looking for an alternative to Microsoft Outlook--or simply an email client/calendar/contact manager with a more modern, less proprietary view of communications--it could well be the free and open-source Zimbra Desktop. Not only does this elegantly-styled program offer most of Outlook's features, it interfaces to social media sites and services: Facebook, Twitter, LinkedIn, WebEx and Digg currently. It supports any POP or IMAP client, including Gmail, Hotmail (Live) and Microsoft Exchange. Unfortunately, importing existing email into Zimbra Desktop from a local client, while not impossible, can be extremely difficult. E-mail interfaces don't get much more elegant than Zimbra Desktop's. At first boot with Zimbra Desktop, you're asked to define a default account; Then you can head to the desktop. Across the top of the main window, you'll see Mail, Address Book, Calendar, Tasks, Briefcase, Preferences, and Social. Most of those are self-explanatory. Briefcase, however, is a sort of built-in online storage feature that stores files using your email account, if it happens to a Zimbra Collaboration Server account. Preferences covers more than preferences; it's also the location where you import files. Social is where you find Twitter feeds, etc. Zimbra's approach to email is a bit different from most desktop clients. As with portable devices, if you use multiple accounts you can view the inboxes combined or separately. Emails are displayed as received or threaded. There are also filters, tags, and all the other normal email client accoutrements, as well as the full control over reply addresses in the form of "personas." For most users, it's better at this than Outlook. The only feature I really missed from Outlook was the right-click "rules/always move messages from" filter from version 2010. Zimbra also resembles your phone or tablet in the way it handles contacts and calendars. It syncs directly with online accounts and it's a two-way relationship--you can edit your contacts and appointments in Zimbra Desktop and the changes will appear online. Unfortunately, while you can see all your calendars overlaid (or just the ones you select), there doesn't seem to be a way to do this with contact lists. The one major fly in the Zimbra Desktop ointment is that it's extremely difficult to import legacy email from local clients such as Outlook and Thunderbird. You can set up the open source version of Zimbra server in a Linux virtual machine, import data from Outlook to the server using the supplied conduit, then sync it or export it to the email client. Or, if your IMAP account will hold enough email, sync everything there then back to Zimbra. Not many end users are going to have the desire or patience for either workaround. I didn't. Unfortunately, Zimbra Desktop vendor VMware was unable to apprise me as to their future plans for direct import. The company may be content to stick with larger groups of users and the server-based import, using the client to leverage business for the email server. That would be a personal bummer for me--I'd like to use the program. I didn't test Zimbra Desktop with a lot of email due to the import issue, but VMware assured me that the program scales well, despite the fact that it stores each message as a separate file. If you don't have a large local store of email to import, Zimbra Desktop is an incredibly useful and powerful email and communications tool. In terms of interfacing with the online universe, it's pretty much alone in "getting it." I definitely recommend taking a look. Those of us with lots of email can only wish. 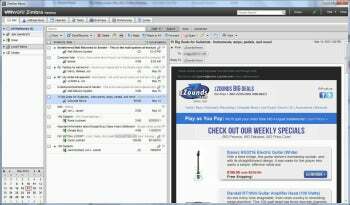 Free e-mail and calendar software Zimbra Desktop works online or off and doesn't limit e-mail storage.